Your first step to choosing a Medicare plan is knowing your choices. Medicare is the federal health insurance program for people who are 65 or older, certain younger people with disabilities, and people with End-Stage Renal Disease (permanent kidney failure requiring dialysis or a transplant, sometimes called ESRD). Medicare is free for people who qualify, and is broken up into four parts A, B, C & D (explained below). You are within three months of your 65th birthday or older. You are under age 65 and have certain disabilities. You have End-Stage Renal Disease, which is permanent kidney failure requiring dialysis or a kidney transplant. In all three cases, you must be a citizen of the United States or a legal, permanent resident for at least five years. Do I pay for Medicare or is it free? Parts A and B are free if you qualify—although there are premiums and deductibles. In most cases, you’ll automatically get Part A and Part B starting the first day of the month you turn 65 if you are already getting Social Security benefits. If you don’t get Social Security benefits and you are 65 or older, you’ll have to sign up for Part A and Part B. To sign up, call Social Security at (800) 772-1213. To find out more about qualifications, click here. Helps cover inpatient care in hospitals (room cost, hospital meals and supplies), including critical access hospitals, and skilled nursing facilities. It does not cover custodial or long-term care. Helps cover hospice care and some home health care. You must meet certain conditions to get these benefits. There is a $1,340 deductible for Part A, but once met, days 1-60 of hospitalization are covered 100%. After 60 days, if you require more hospitalization, you must pay an amount set by Medicare. Helps cover tests, shots and some preventive services to maintain your health and to keep certain illnesses from getting worse (flu shots, PAP tests). There is a monthly premium ranging from $134 to $428.60, depending on your income, and a $183 annual deductible. Once the deductible is met, Part B generally pays 80 percent of the Medicare-approved amount for covered services, which means you pay 20 percent of those services. 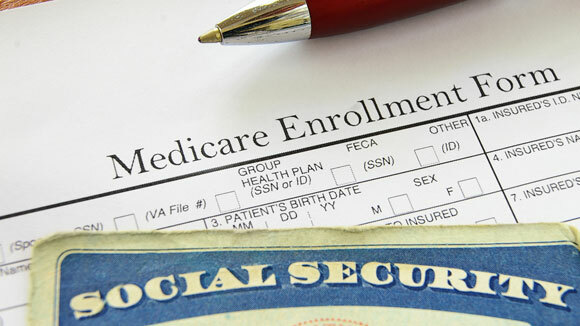 Part A and Part B together are commonly referred to as “Original Medicare.” Original Medicare is offered by the government, and again, in most cases, you’ll automatically get Part A and Part B starting the first day of the month you turn 65 if you are already getting Social Security benefits. Instead of getting Medicare Part A and Part B, you have a choice and you can enroll in/purchase a Medicare Advantage Plan (also called “Part C”). Medicare Advantage Plans are health plans run by Medicare-approved private insurance companies, and have different rules and costs, but offer at least the same benefits of Medicare Part A and Part B, and in some cases also include prescription drug coverage, vision, and dental—but the health coverage is generally limited to in-network doctors and hospitals. Why would someone opt to buy a Medicare Advantage Plan over getting Medicare Part A & Part B? You take prescription drugs. With a few exceptions, most prescriptions aren’t covered in Original Medicare. Many Medicare Advantage Plans include prescription drug coverage. Your area has a large selection of in-network doctors and hospitals. You don’t travel and your doctor is in-network for the Medicare Advantage Plan you want. You’re healthy and don’t expect to need hospitalization services or medical attention beyond preventive health care. You want to cap your out-of-pocket health spending. Original Medicare has no out-of-pocket maximum. You keep paying a portion of the cost of services you use, unless you have a Medicare Supplement Plan. Medicare Advantage plans, by law, have an out-of-pocket maximum of $6,700 per year, as long as you use in-network doctors. Past that limit, the plan pays for all covered expenses. You want an alternative to the 20% coinsurance charged by Original Medicare Part B – remember, the 20% is unlimited (unless you have a Medicare Supplement Plan), whereas Medicare Advantage out-of-pocket is limited to $6,700 for in-network services. You want coverage for vision and dental. Original Medicare doesn’t cover these outline services. Certain Medicare Advantage Plans do. There are two ways to get prescription drug coverage through Medicare – either as an add-on known as Medicare Part D to your Original Medicare Plan (Part A and Part B), or as part of your Medicare Advantage Plan (Part C). There are several different Part D plans, and they vary in cost and medications covered. Also note that Medicare Part D is provided by private insurance companies that have contracts with the government, unlike Medicare Part A and Part B, which is provided directly by the government. Each Medicare Prescription Drug Plan has its own list of covered drugs, called a formulary. Many Medicare drug plans classify drugs by tiers and each tier has a different cost associated with it. Before you choose a Prescription Drug Plan, it’s best to look at the plan’s list of drugs to see if your medication(s) is covered, and how much it will cost. To find out more about Part D coverage, click here. What is Medicare Supplement Insurance (also known as Medigap)? Medicare Supplement policies fill in the gap between what Original Medicare covers and what it doesn’t. If you have Original Medicare and you buy a Medigap policy, Medicare will first pay its share of the Medicare-approved amount for covered health care costs. Then your Medigap policy pays its share. How are Medicare Supplement plans and Medicare Advantage plans different? A Medigap/Medicare Supplement policy is different from a Medicare Advantage Plan. A Medicare Supplement Plan is insurance coverage in addition to your Original Medicare coverage. It helps cover the 20% of hospitalization and doctor expenses that Parts A and B don’t cover, and you can visit ANY doctor who accepts Medicare. The most you will pay in a given year is the sum of your Medicare Supplement and Medicare Part B premiums. A Medicare Advantage Plan is a way to get Medicare benefits instead of getting Original Medicare. Medicare Advantage Plans cover in-network doctor visits, hospitalization, and often prescription drug costs. Your out-of-pocket maximum is $6,700 per year, as long as you use in-network doctors and hospitals. How can I find out more about Medicare and have my questions answered?